This year's event is located in Draynor Village. It began on October 30th, and ended on November 13th. 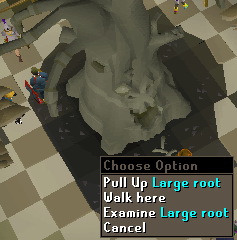 Apparently Diango has tried to cut his costs of production by stealing wood, but it doesn't look like it's working! Note: This event was only available from 30 October 2006 until 13 November 2006. 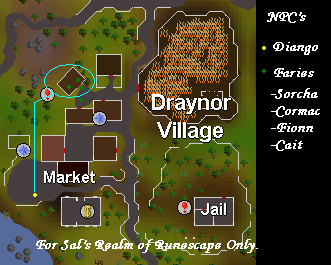 Speak to Diango in the Draynor Village marketplace. 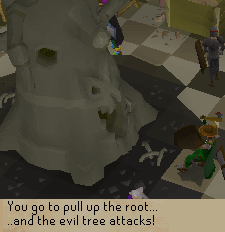 Talk to Diango in Draynor Village and select "Talk about H'ween." 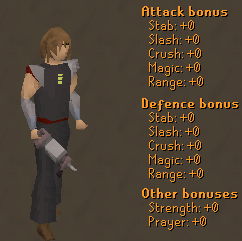 You will find out that he stole some wood from Draynor Manor to cut price costs in order to get ready for Christmas since last year was terribly rushed in a funny little conversation about middle names. He will ask you to help. Of course you will! You need to spray 3 of each color ghost with it's corresponding color. Also, there is a Large tree down there that will swallow you if you annoy it. Yes, swallow you! Anyways, head on north to Diango's workshop from Christmas. To get ready, load a "White Destabiliser" with your Ghostbuster by selecting "Use White Destabiliser". You always have to put the white one to get the ghost out of the object, then the correct color of the ghost to dismiss it. Also note that once you spray any object, and you didn't get the "Scared Emote" last Halloween, you will get it now. Skeleton Boots : Reward for dismissing 3 of one kind of Geists. Skeleton Gloves : Reward for dismissing 3 of 2 kinds of Geists. Skeleton Leggings : Reward for dismissing 3 of 3 kinds of Geists. Skeleton Shirt : Reward for dismissing 3 of 4 kinds of Geists. Skeleton Mask : Reward for dismissing 3 of 5 kinds of Geists. 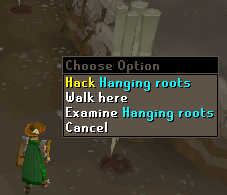 Before you go back to the workshop, put on your Halloween clothing or store it in the bank, or Diango won't give you your reward for hacking the roots. Climb down to the main floor and head over to the tree. You will see some roots. Try to pull them up, and you will get sucked under. Once you are down there, you will see plenty of hanging roots to hack at to your heart's content. Cut at least 10 "Evil Roots." To get out, find the ladder icon on the minimap and select "Climb Roots." 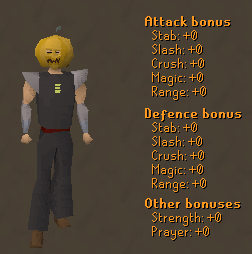 Head on back to Diango, and you will get a Jack'o Lantern Mask. 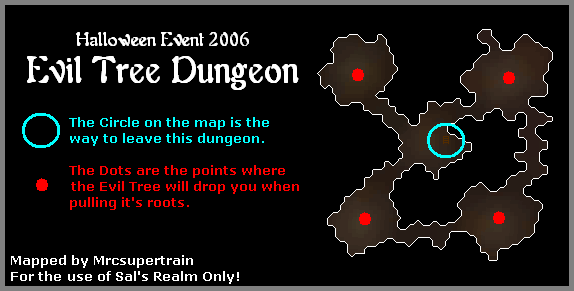 Congratulations, you have completed the 2006 Halloween Event! You cannot bank either the "Evil Roots" or the "Ghostbuster 500" or any color "Destabiliser" - a magical force will stop this from happening. Once you have completed both parts, you cannot re-enter the workshop. 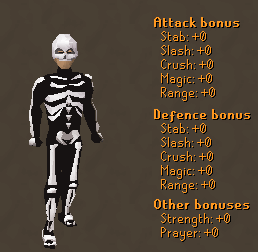 If you lose either the skeleton outfit or the pumpkin mask, you can get another from Diango for free.